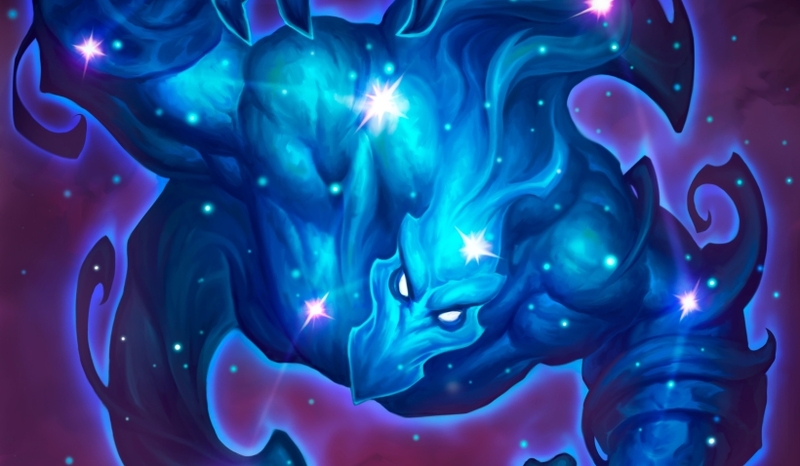 Our Spell Damage Mage deck list guide features the best Rise of Shadows deck list for Season 61 of Hearthstone (April 2019). Our Spell Damage Mage guide also contains Mulligan advice, card combos and strategy tips. Spell Damage Mage is a Hearthstone deck that any Tempo Mage fans out there should enjoy given some of the similarities the archetypes share with one another. It follows a familiar game plan to that old favourite by taking advantage of the powerful spells available to Mage, but also enhances them even further with multiple Spell Damage effects to clear minions or go for direct damage. A number of new cards in the Rise of Shadows set have given this deck a new lease on life, though that hasn’t translated to a great deal of success in the current meta. Nevertheless, it’s still very early days so as more decks come in and out of favour there may yet be some space for Spell Damage Mage to succeed. As we like to be prepared for everything, we’ve put together this Spell Damage Mage guide so you can try it out now or be ready if it climbs the tier list. Included is the best version of the deck currently seeing play, along with some in-depth strategy advice and a breakdown of some of the key card combos in the deck. Right now, this is the best version of Spell Damage Mage being played on ranked ladder. It sits at a rather unhealthy win rate but could see some refinement over the coming weeks. We’ll be sure to update this section if any major changes are made. With enough experience playing Tempo Mage you should have a pretty good idea of the approach behind Spell Damage Mage too. To cover the basics, though, you’ll want to use your cheap early game spells in order to clear your opponent’s minions, while also using cards such as Magic Dart Frog to eke out some additional points of damage from them. Once the board is under your control you can start moving on to play some of the more threatening Spell Damage minions in the deck. When you see these effects all stacking together your win condition becomes a lot clearer if you take a glance at the damage numbers now sitting on Fireball. Early game: You should be aiming to keep your opponent’s side of the board clear as much as possible so that they don’t get a foothold in the game. Don’t make hasty plays that waste the value in some cards, though, as sometimes it’s better to wait for just one more turn when you can unleash an area of effect spell that’s been buffed up with some Spell Damage. Whatever you do, don’t waste spells going for face damage at this point - it’s fine to pass a turn or just draw cards if needed. Mid game: Now you can start to make the strong tempo plays that this deck is built for. Combine some of the Spell Damage effects with the spell cost reduction on Sorcerer’s Apprentice and you’re looking at some very cheap spells that have the potential to do tonnes of extra damage. With these combined, you should be able to wipe out most single creatures or wider boards of weaker minions. One danger of this deck is running out of resources very quickly, so make sure you look for your card draw options through Stargazer Luna and Arcane Intellect too. Late game: Things might start looking desperate if you’ve hit the late game and are still far from finishing off your opponent. At this point, if you’re running out of steam, you’ll want to generate some more cards using Mana Cyclone and Archmage Antonidas to find your finishers. A hand of extra Fireballs, all with bonus Spell Damage, is definitely one way to do it, although it requires some careful setup! 1. Try to save cards where possible and use your hero power to ping down some of aggro’s weaker minions. 2. Lots of your cheap spells such as Arcane Missiles, Cinderstorm and Shooting Star can work as effective board clears once buffed up with some Spell Damage. 3. Keep an eye on how much burst damage you have in hand at all times. There may come a moment where it would be better to avoid trading and start pushing for face damage if you can finish them off in a turn or two. 4. Try to combine lots of your spells with Magic Dart Frog. The extra damage this minion throws out can be enough to destroy aggro’s low Health creatures. 1. With a lack of hard removal in the deck, find alternative ways to deal with their larger creatures, such as Freeze effects. 2. Avoid using big burst damage spells such as Fireball to clear off minions where you can. These are key parts of your win condition and if you spend them taking out creatures you may struggle to finish off your opponent. 3. Get as much value from Mana Cyclone as possible. You’ll need the extra cards if the game goes long against control. 4. Archmage Antonidas has a lot of power in the control matchup but be sure to generate some Fireball spells from it on the same turn, as your opponent will aim to remove it immediately. 1. Magic Dart Frog: A decent early drop that can also help with some trades thanks to the extra damage it fires off after you cast a spell. 2. Magic Trick: A way to generate some more early game spells that can often be played for free if you have Sorcerer’s Apprentice down. 3. Sorcerer’s Apprentice: A solid two-drop that can contest the board early and offer a nice discount on your cheap spells to give you a tempo edge. 4. Spellzerker: A good minion to use to fight for the board early, and if you manage to trigger its bonus Spell Damage you’ll achieve some huge value early off your spells. 5. Stargazer Luna: Spell Damage Mage risks running out of resources quite quickly and this is a way to ensure your hand is regularly full. - Elemental Evocation reduces the cost of the next Elemental card you play by two mana, and so works brilliantly alongside Mana Cyclone and Cosmic Anomaly. The former even more so as it counts as an extra spell towards that card’s effect. - Any already Frozen creatures will take two damage if you cast Ray of Frost of them. As it’s a Twinspell, you can also cast Ray of Frost twice in a single turn - first to Freeze a minion and then a second time to deal the damage. - Cosmic Anomaly and Spellzerker provide an extra two points of Spell Damage. For the former, the effect persists for as long as the minion is out in play, whereas the latter needs to be damaged for the effect to be live. Bloodmage Thalnos offers a constant point of Spell Damage while on the board too. - As long as Sorcerer's Apprentice is on the board, all of your spells will cost one Mana less. This effect stacks with multiple copies of the minion. - To get the full use of Magic Dart Frog, make sure you play it on a turn when you’ll also be able to follow it up with a spell or two. That extra one damage to a random enemy minion can be the difference between leaving something with one health and clearing the board! - Now that Aluneth is in Wild you’ll need new ways to generate additional resources in Mage. Luckily, Mana Cyclone is here to fill your hand with Mage spells - just make sure you’ve cast enough spells in the same turn to get the full effect from the card. Arcane Missiles: Slightly risky removal spell as it can hit your opponent’s face as well as their minions, but also benefits greatly from all your Spell Damage effects. Magic Trick: A way for you to generate an extra spell for your deck and gives you room to adapt to many situations. Shooting Star: Can be an extremely powerful board clear when buffed up with a few Spell Damage effects. Bloodmage Thalnos: Cheap extra Spell Damage that also cycles a card on death. Just good value all-round. Frostbolt: Some of the deck’s best burst damage that can also be used to remove minions or Freeze a bigger threat for a single turn. Magic Dart Frog: Like a Knife Juggler but for spells, it allows you to get extra value out of everything you cast which can be the difference between killing a minion or leaving it on one Health. Mana Cyclone: An excellent way to generate some additional spells in the late game, but it is a bit of a gamble as to what you’ll receive. Sorcerer’s Apprentice: Allows you to cast multiple extra spells on the same turn by reducing their cost by one and also serves as a decent minion. Spellzerker: Offers some significant Spell Damage if you can activate the effect. Don’t be afraid to ping it with your hero power to make it live. Stargazer Luna: Some much-needed card draw for the deck now that Aluneth is off in Wild. The positional requirement can be awkward to play with but it can work wonders with the right cards. Cosmic Anomaly: More Spell Damage for the deck at a decent cost, though the stats on this minion aren’t great so try to combine it with spells on the same turn. Fireball: The most important burst damage in the deck. Combine this with as much bonus Spell Damage as you can and you can take off some substantial Health from your opponent. Archmage Antonidas: This classic legendary is still around for its way to generate multiple extra copies of Fireball in your hand that can make bursting down your opponent much easier.